If you're passionate about art, food, and wine, the 2018 American Express Winter Sculpture Fair offers the perfect day out in the country to spend with family and friends. 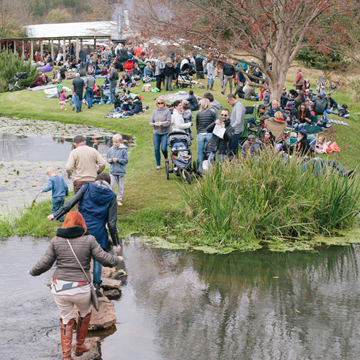 Artlogic have partnered with Franschhoek Tourism to bring the finest chefs and winemakers from the Cape Valley to the spectacular NIROX Foundation Sculpture Park, in the Cradle of Humankind. Thanks to its location between towering mountains in the beautiful Cape winelands, the Franschhoek Valley is as renowned for its landscapes as it is for its culinary excellence. Many would argue this is the food and wine heartland of the country, and we have done our best to recreate the mythical experience of dining in the Valley by bringing these top producers to Gauteng. The NIROX Foundation Sculpture Park is undeniably one of Gauteng’s most beautiful locations. It is not usually open to the public, so join us on the weekend of 12 and 13 May 2018 for what is gearing up to be a truly memorable experience. Along with great food and wine, you’ll be able to enjoy a larger-than-life artworks on display. Please note no tickets will be available at the door, so book online to avoid disappointment. Children 12 and under enter free. Regret no pets, balls or bikes allowed. No refreshments to be brought into the event, as food and drink will be sold on site by Franschhoek exhibitors. Sorry, this event has already taken place. © 2019 Tixsa. All sales are final. Tickets are non-refundable.